Mr. Adrian Lewis “Peabody” Taylor, 34, of Suitland, MD ( formerly of Camp Hill) died Sunday, June 24, 2018 at Prince Georges Hospital, Cheverly, MD. Funeral services will be held at Centerview Baptist Church, County Rd 89 North, Camp Hill on Friday, July 6, 2018, at 11:00 a.m. (CST) with Rev.Jimmial Harrison  officiating. Interment will be in the church cemetery. The remains will lie in state at the church from 10:00 a.m. (CST) until the funeral hour. Public viewing will be at Vines Funeral Home, Thursday, July 5, 2018 from 12:00 to 6:00 p.m.(CST). Adrian was born in Tallapoosa County on April 6, 1984, to Arthur Lewis and Evonne “Bonnie” Taylor. He  was the youngest of four children. Adrian accepted Christ at an early age and joined the Centerview Baptist Church. He was educated in the Tallapoosa County School System and was a graduate of Edward Bell High School. Adrian received both his Bachelor’s and Master’s degrees from Troy State University, Troy. 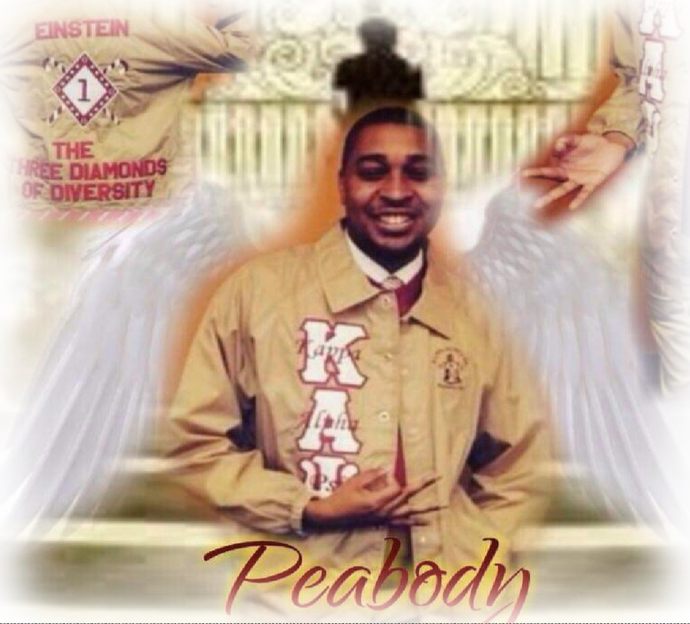 He was an active member of Kappa Alpha Psi Fraternity Inc, and felt every single member of Kappa Alpha Psi was his brother. At the time of his death, Adrian was living in Suitland, MD. He had become a devoted member of Reid Temple AME Church and was employed by Fairfax County Public Schools as a High School Counselor. Adrian had a wonderful smile and was a joy to all who came in contact with him. He dedicated his life to God by helping others and  freely gave of his time. Adrian will yet live because of the impact he made in the lives of so many others. Adrian is survived by his parents: Arthur and Bonnie Taylor, Camp Hill; one sister: Tamiko Averitte (Greg),  Sylacauga; two brothers: Kelvin of Atlanta and Arthur, Jr (Kim), Opelika; a paternal grandmother: Mary Inez Taylor, Camp Hill; four nephews: Ellis Holloway IV, Isaiah Holloway, Kendrick Taylor and Shawn Tucker all of Camp Hill; a special godmother, Sylvia Spratling; and, a host of aunts, uncles, cousins and friends. Adrian touched my life in a very special way and my memories of him at Manassas Park High School are forever in my heart! Love you Adrian! Job well done my Friend!! Professor Taylor, you are missed! Thank you for your gentle guidance and encouragement. My sincerest condolences to your family. May you rest in eternal glory. My condolences to the family. I knew Adrian for the one year he was my son’s counselor. He was kind, professional and humble. He really helped my son stay focused and on track to graduate with his senior class. Mission accomplished! I emailed him at the end of the year to thank him for all of his assistance and let him know how much I appreciated him and what an amazing job he did all year. Thank you for coming into our life’s. You will be truly missed. May you Rest In Peace. My most sincere sympathies to the Taylor family. Adrian was kind and gentle person who made a positive impact on everyone he came in contact with. He will be greatly missed. Please accept my heartfelt sympathy. The God of loving kindness promise he will swallow up death forever, and he will wipe away the tears from all faces.-Isaiah 25:8. May you have many cherished memories that you shared with your loved one. My thoughts and prayers are with you all! We all loved Adrian but God loved him more! Take comfort in knowing that he is in a better place with his heavenly father! My thoughts are with my family. Adrian had an uplifting smile just like his mom. Praying that the Lord will comfort you during the loss of Adrian. My sincere condolences Family for the loss of your son. Praying for peace and comfort. May God strength you during this difficult time. Such a wonderful friend, brother and colleague. Praying for the family. Rest On! Such a sweet smile will always be remembered . My condolences to the family,friends and colleagues. He will be dearly missed. I'm so sorry for your loss my prayers are with you all. Our students and staff are better human beings because of the impact you made on all of us! Rest in Paradise AT!